Thinking of Ancient Rome immediately brings up names such as Caesar, Nero, and Caligula. These seemingly larger than life characters have become popularised as brutal tyrants to varying degrees. Fortunately, there is more to Rome than the stories of the Emperors. The great scholars, authors and engineers of Rome have also left an indelible mark in history, providing direct influence and inspiration to the modern era. Delving a little further into Rome, you will eventually come across Marcus Tullius Cicero. Born in a small town south of Rome called Arpinum (modern day Arpino) and bestowed with the gift of intellect, he went on to became one of Rome's most influential figures - making a deep mark in his own time and down through history. Cicero was a persistent figure in the political intrigues surrounding the rise and fall of Julius Caesar, and eventual succession of Octavian(later be known as Emperor Augustus). This was rather romantically, though entertainingly portrayed in HBO's recent Rome TV series, though Cicero is not an uncommon presence in historical fiction - one of the most enjoyable of these being Imperium and Lustrum, titled Conspirata in the US. The events of Cicero's life are related through his secretary, Tiro. The final title in the trilogy will be released in 2011. 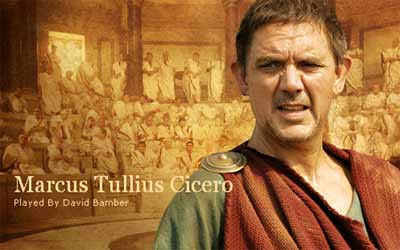 Many who saw HBO's Rome, would have been impressed by the superb portrayal of Cicero by David Bamber. Cicero's involvement in the events around the accession of Caesar and Augustus may have been accentuated somewhat in the interests of drama, yet the sense of a man of honour and principle strongly shines through. The Second Season episode, From The Pen of Marcus Tullius Cicero is particularly mesmerising, with the effect of Cicero's words having quite dire consequences, for those around him and eventually himself. In the aftermath of Julius Caesar's assassination, Rome fell under the control of the Second Triumvirate, which consisted of Mark Antony, Marcus Lepidus and Octavian. Hoping to play the young Octavian against Antony, Cicero delivered a stinging set of speeches called the Phillipics denouncing Antony and praising Caesar's rightful heir, Octavian. It was the ire generated by these actions that led to Cicero's eventual death. Historians such as Appianus and Plutarch tell us that Cicero was decapitated - his hands were also cut off and nailed to the main speaking platform(Rostra) in the Forum in Rome. The fact that we have a healthy amount of his private letters today lies testament to the reverence history has had for his intellect. Many phrases often used in political and constitutional debate today are ascribed to the intellectual efforts of a man who lived over 2000 years ago. With Cicero being neither a military hero nor a poet along the lines of Virgil or Horace, this legacy is quite astounding. Despite his many intellectual and political achievements, one particular incident in Cicero's life stands out as quite interesting, and unusual. In his early twenties (c.83 BCE), Cicero started his career as a lawyer. His famous involvement in the defense of Sextus Roscius, a young man accused of killing his father for his fortune is still recounted today by historians and legal scholars alike. In this case, Cicero's dedication to detail and use of legal strategy are still held in reverence in legal circles. Cicero demonstrated that his search for the truth in a case knew no bounds, despite the very real dangers which existed when allies of the dominant political and military figures of the day were involved. Cicero's recounting of his Oration for Sextus Roscius is a great read. An English translation can be found here. It's simply a great courtroom drama, Cicero style! Likely due to the attention gained from the Roscius case, Cicero decided to leave Rome for a short time and in 79 BCE travelled to centres of learning in Greece, Rhodes and Asia Minor(modern day Turkey.) Here he passionately studied Rhetoric and Philosophy. 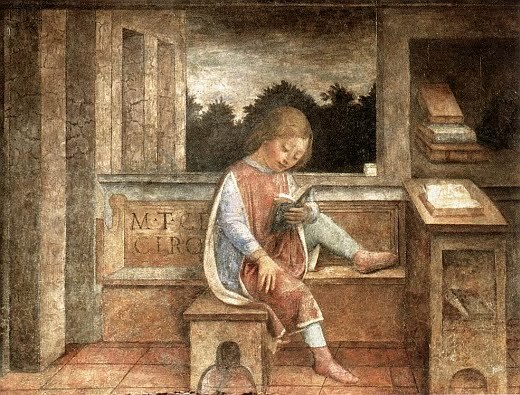 Cicero's zeal for Greek learning filtered into his work for the rest if his career, and historians do assign him some credit for the increasing respect Greek Philosophical ideas were to achieve in Rome. In 75 BCE. at age 31, Cicero entered political life, occupying the office of Quaestor of Sicily, a role chiefly associated with overseeing financial affairs. From a political and legal perspective, Cicero's term in Sicily is moreso associated with his fearless prosecution of the corrupt Governor Gaius Verres. Whether it was during his studies in Greece, or from an earlier time, we know that Cicero was aware of the achievements of the great mathemetician Archimedes of Syracuse, who lived in Sicily(then ruled by the Greeks). Archimedes is considered by many to be the greatest of the ancient mathematicians of the Western World - with many astounding achievements in military engineering, mechanics, including an highly accurate estimation of the value of Pi. According to legend, Archimedes was killed by a Roman soldier during the Siege of Syracuse in 212 BCE. He was buried according to his wishes, his gravestone being marked by a cylinder with a sphere in it. The grave site was believed lost, but Cicero took it upon himself to seek it out, as a little side quest to managing the financial affairs of Sicily. "When I was questor in Sicily I managed to track down his grave. The Syracusians knew nothing about it, and indeed denied that any such thing existed. But there it was, completely surrounded and hidden by bushes of brambles and thorns. I remembered having heard of some simple lines of verse which had been inscribed on his tomb, referring to a sphere and cylinder modelled in stone on top of the grave. And so I took a good look round all the numerous tombs that stand beside the Agrigentine Gate. Finally I noted a little column just visible above the scrub: it was surmounted by a sphere and a cylinder. I immediately said to the Syracusans, some of whose leading citizens were with me at the time, that I believed this was the very object I had been looking for. Men were sent in with sickles to clear the site, and when a path to the monument had been opened we walked right up to it. And the verses were still visible, though approximately the second half of each line had been worn away. So one of the most famous cities in the Greek world, and in former days a great center of learning as well, would have remained in total ignorance of the tomb of the most brilliant citizen it had ever produced, had a man from Arpinum not come and pointed it out!" 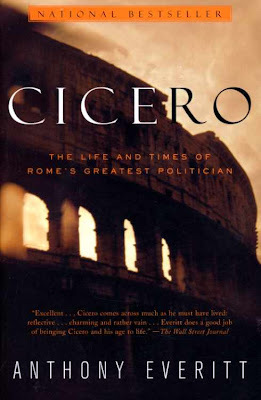 A highly recommended modern title exploring Cicero is Anthony Everitt's Cicero: The Life and Times of Rome's Greatest Politican. Written with a modern reader in mind, Everitt's books on Rome are perhaps less scholarly than some would appreciate, but a great way to approach a source that ties together many sources and presents them in a flowing manner. 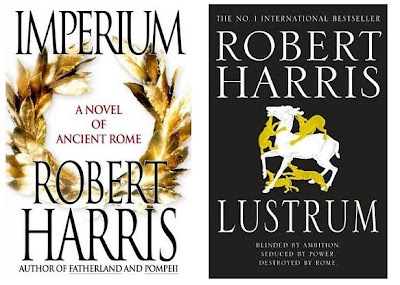 HBO's series will give you some wonderful imagery, Robert Harris' Imperium/Lustrum will accentuate the drama of the events - Everitt's work tells us how we came to know these things. Another comprehensive summary of Cicero's life and works, Anthony Trollope's Life of Cicero is available as a free ebook from project gutenburg or as an audiobook from LibriVox. It is somewhat harder going than Everitt's work, but easier to take in if listened to in audiobook form. By many reports, including his - Cicero was quite aware of his talents and influence. The Tusculan Questions' description of the discovery of the the tomb is just one of many examples of Cicero's open boastfulness(not considered entirely unusual by Roman standards). We can only guess what Cicero would have thought of the enduring popularity and esteem he is held in to this day. I feel a special connection to Cicero ever since competed in the Certamen Ciceronianum. I'm just sorry I didn't have this kind of discipline and interest then, but I'm glad I do now :) .